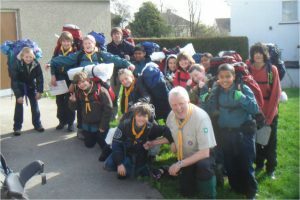 41st Bradley Scouts are a successful and growing group in the Huddersfield North district of West Yorkshire. Its a great place to do our scouting. We’ve got plenty of places to get out and get muddy with miles of walks, both local and national close by. If you’re new to the area, the scout group is a good place to get involved in something that really does make a difference to young lives, building confidence and self esteem. We do this by learning through adventure and fun. We meet on a Wednesday and Thursday evening at Bradley Methodist Church but we’re often not there because we’re off having adventures and getting muddy elsewhere! Want to join in the fun? fill in the contact form for more information or call 0844 414 2315. What are you waiting for… ! We’re currently on our summer break, although that doesn’t mean we’ve stopped scouting we’re just travelling the Uk and the world on new adventures!